Six DEAG members met on Thursday 13 December for our final get together of 2007. The question of the layout challenge was discussed and several of us decided to enter, so we must get our entries in by the due date! David (E) spent the evening sketching out a layout for possible entry to the competition. Nick brought along a Worsley Works kit that he had recently built, just the wheels and paint to complete. I have not seen this one before and he had made an excellent job of soldering, very clean. 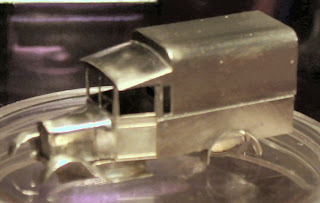 It represents an LMS Express Parcels delivery van, with later style body on a Fordson 'B' chassis. The only items not in the kit are the radiator cap, steering wheel/column and the wheels. What do you think? Nick spent the evening working on a flat wagon to go under an 'N Gauge Society' container. Bill brought along a tool/jig that he built to make loops for DG couplings. Under his right hand is a guillotine with a stop to cut the wire to the correct length, and the operation you see in the photo is the wire laid over a channel and the lever in Bill's right hand is pushing the wire down into the channel to form a 'U' shape. This lever remains in the slot whilst each of the side levers (pointing towards the camera) is brought round in turn to bend each leg over to form a complete loop. Clever! The resulting loops are very neat and to the correct size. 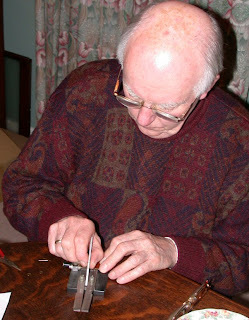 Bill also has a jig for forming the dropper and for holding it and the loop correctly for soldering. These were not on show unfortunately. 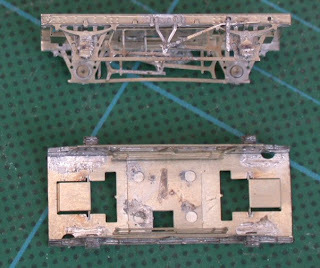 David (S) and I were working on wagon chassis for our various projects of which more later. The DEAG would like to wish you a Merry Christmas and a Happy (modelling) New Year!